Creve Coeur has been one of the most progressive cities in the St. Louis region when it comes to climate change. They were the first in the region to study their greenhouse gas emissions (GHG emissions), one of the first to adopt the U.S. Mayors Climate Protection Agreement, and one of the first to create a Climate Action Plan. Their goal, adopted in 2010, was to reduce GHG emissions 20% by 2015. Their new follow-up GHG inventory for the year 2014 is the first one in the region. 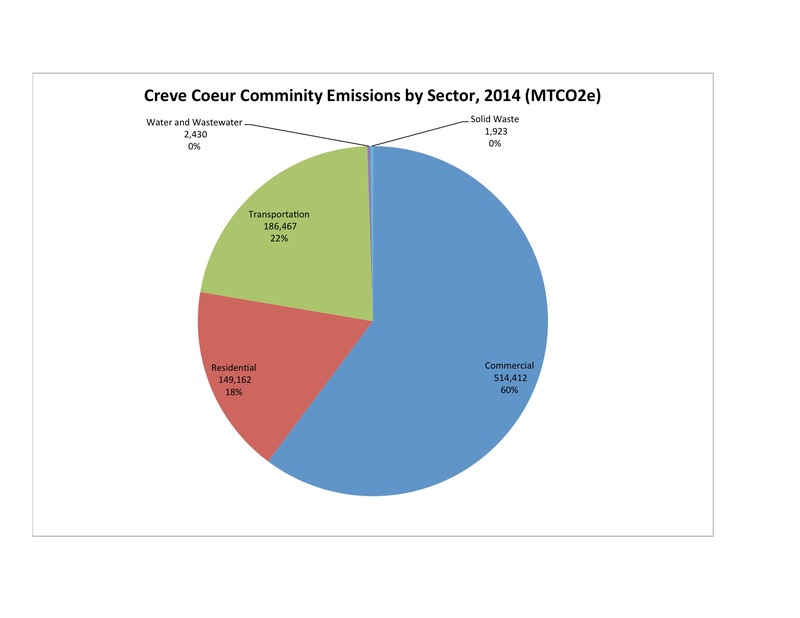 Creve Coeur community emissions declined 10% from the 2014 business-as-usual estimate. Data source: Garcia 2014. 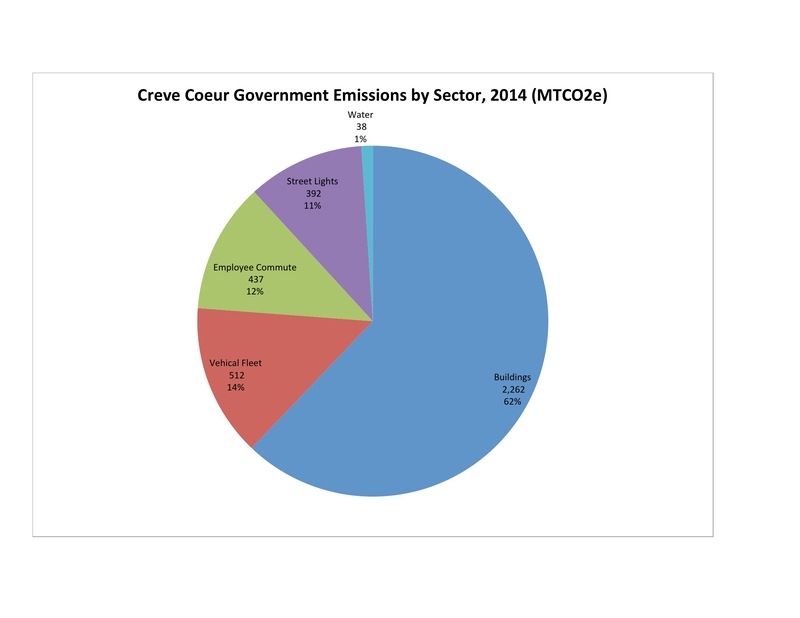 Using the social cost of carbon as estimated by the federal government, Creve Coeur found that by reducing its emissions that much from business as usual, the city had prevented almost $2.8 million in environmental and economic damage in 2014 alone. Commercial buildings accounted for the lion’s share of emissions. Data source: Garcia 2015. Fully 60% of Creve Coeur’s community emissions came from energy consumed in commercial buildings (second chart at right). Some of this energy represents energy to operate the building, and some of it represents energy used in conducting the activities that occur inside the building (refrigerators in a supermarket, for instance). Together, the built environment (commercial plus residential) account for 78% of emissions. Emissions resulting from operations of the city government are a subset of total community emissions, but they are studied separately in a GHG inventory for 2 reasons. First, the government controls its own operations directly, while can only attempt to influence community operations through policy. Second, it helps to demonstrate leadership. 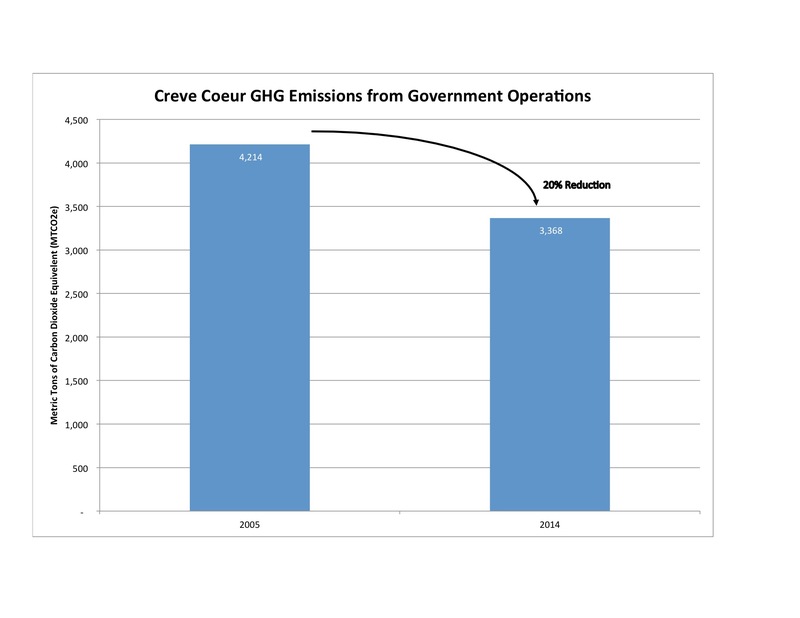 Creve Coeur emissions from government operations declined by 20%. Source: Garcia 2015. 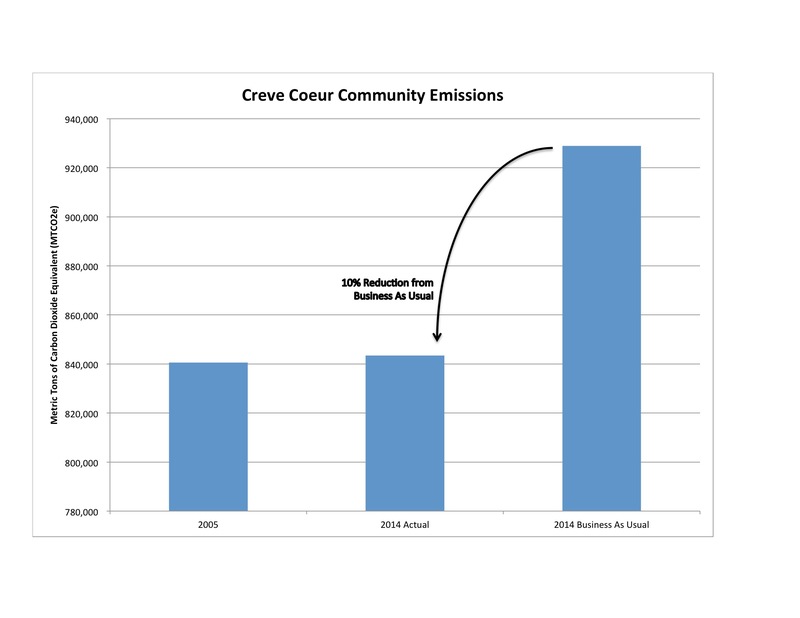 Emissions from Creve Coeur government operations were reduced by 20% from 2005 (third chart at right). Thus, the Creve Coeur government met its goal of a 20% reduction a year early. The reductions were achieved mostly through energy conservation. By reducing energy consumption, the city saved $31,022 in 2014, despite experiencing a 7% increase in energy rates. As in 2005, the largest source of GHG emissions were the three large buildings operated by the city: the Dielmann Recreational Complex, the City Government Center, and the Public Works Garage. The fourth chart at right shows the data. As data from municipalities in the St. Louis region continues to accrue, it becomes ever clearer that our greenhouse gases come primarily from energy consumption, and that dirty electricity is the #1 culprit. We simply must have clean energy from our electric utilities. By reducing GHG emissions, the Creve Coeur has prevented $2.8 million in environmental damage and has reduced its energy costs by $31,022. Those benefits will accrue to the city every year it continues to abate GHG emissions. Well done Creve Coeur. Garcia, Luis. 2015. City of Creve Coeur, Missouri Updated Greenhouse Gas Emissions Inventory for 2014. This is a public document, and hence, is available from the City of Creve Coeur, 300 N. New Ballas Rd., Creve Coeur, MO, 63141. At some point in the future it will likely be posted on their website, but it is not there yet. Kellum, Spencer. 2008. City of Creve Coeur, Missouri Baseline Greenhouse Gas Emissions Inventory for 2005. Available on the City of Creve Coeur’s website at http://www.creve-coeur.org/DocumentCenter/Home/View/760. By mogreenstats in Climate Change, Greenhouse Gas Emissions on 2016/01/07 .